Today I completed 20 hours on the tutor with my twiddler 3 (right handed). Wanted to share my stats, make some observations and ask a few questions. I focused exclusively on lower case letters for first 20 hours to help me understand the learning process with better stats. I plan on adding numbers, symbols, capitalization and then control keys next. To incrementally increase my speed, I found it necessary to stabilize the twiddler in my right hand with my left hand since going faster than "normal" causes me to have a heavy touch. I hope to develop a lighter touch and wean myself off this. Certain chords cause the twiddler to twist slightly in my hand as I type. I have to occasionally correct this by re-centering it in my hand. Not sure how to fix this. I haven't found a good placement for the strap. Since I've been bracing, I mostly use it at its widest to just keep it attached to my hand. It doesn't seem to do a good job of holding it in the ideal position. If it's too tight it gets in the way of typing. It doesn't prevent twisting. Has anyone tried training both hands? If yes, and above doesn't work well, has anyone tried training off hand to handle navigation/control keys exclusively? Does anyone have any data/advice on how long to train everything (letters, numbers, symbols, capitalization & control keys)? Unfortunately this is just an interesting toy to me until I've mastered all of these. I find the one finger chord for backspace to be the most problematic in the standard config. I hit it by accident very often. I didn't run into this issue as much for delete key. Though it probably shouldn't be a one finger chord either. Your comments and feedback are welcome. Thanks and may your day be awesome! Great write up. Thank you for doing it. 1 hour for 20 days is quite a commitment and a lot of effort. Good job! I was actually quite surprised you got that much progress in such a short time. For 2 hands questions, I don't think it's doable and Twiddler is not designed for this. About the length of training, from my experience of training and retraining again and again for the last couple of years it takes me about 20 days to completely transfer chords from my consciousness to my muscle memory. I was not able to shorten that process. The number of new chords to learn usually doesn't matter that much. Right now I'm relearning 19 new chords at once and it's quite doable. I find the one finger chord for backspace to be the most problematic in the standard config. Then change it! It's so simple to make a change. 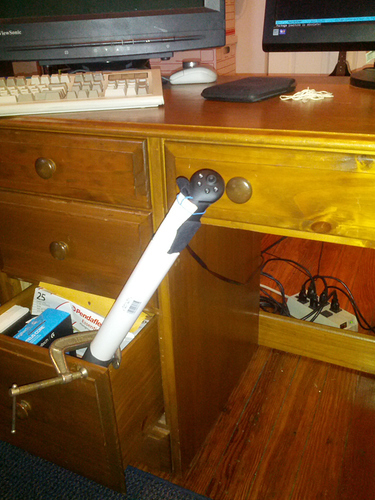 With regard to stabilization, I place the bottom of the Twiddler against my body or sometimes the furniture. Now I've built a decent mount for it, by cutting the end of a pipe into an appropriate shape. I use this much of the time and I'm thinking it would be a good idea to make something like it for mobile use, that I could rest against something or wedge between the couch cushions when I sit there. I find that the strap works best if it's as snug as I can comfortably make it. I don't find it interferes with typing. You mention it twisting too... is it firmly seated in your palm? Even with the strap set the best way I can make it, I still find some bracing helps, because the strap can't prevent sliding up/down very well. I couldn't agree more about the importance of Twiddler having exactly the same position in your hand. Wow that's intense Alex! Is that play dough haha?? Honestly I was thinking to myself that it needed some sort of custom hand moulding. Hey Paul -- would you mind posting a pic of your mount? I'd love to check it out. Is that play dough haha?? It's a "Silicone Putty" made by EasyMold. (5) BackSpace is a good candidate for a single button (especially early on when the wrong character comes out a lot), but it needs to be in the right spot. I'd recommend using a more tailored mapping, e.g. backspice or one you've created for yourself with Twidlit. Training takes a while, better not to waste time on an inferior mapping. (3) You can certainly use two hands at once, but not to split modifiers from their keys. I don't find hand positioning an issue these days, except sometimes towards the end of the day on some awkward chords when my muscles get weak. Perhaps my hands are a good fit, though, and I use a mapping that does not require the thumb buttons. Yeah, here it is. If it's not clear what's going on, that's a PVC pipe which I cut nearly all the way through, leaving a tongue going up the back of the Twiddler. It's kind of oddly shaped but just because I was planning as I cut. On the other side there's a very short counterpart that keeps the bottom of the Twiddler in place. And a twist tie goes around the top. I used some stuff that was in my drawer to brace the bottom end and clamped it as you can see. Wrapping it with duct tape where the clamp holds it did a lot for stability against rotation. Wow Paul!! That's a mount!! No twisting using that. Thanks for pic! @AlexBravo thank you so much for this tip!! I too have purple play doh now. It's so much better than the spacer I was using. I was able to even get it steady enough to not need to use my thumb to brace it and reposition my thumb over the thumb buttons. Wow so much amazing. I'm nowhere near 20 hours, but I can already see I won't be bulking up the back of the Twiddler. I need it as far back as it will go to have any chance of half-way comfortably pressing the A, oddly enough. This also helps with the bottom row. Hmm... thickening the side might help with the A, I guess. Still working on it. @paul: I almost want to rig it like yours, but with a joystick at the base. That would probably be ridiculously hard to control, though. In any case, the main reason I bought a Twiddler was so I didn't have to keep my hand in a fixed position. 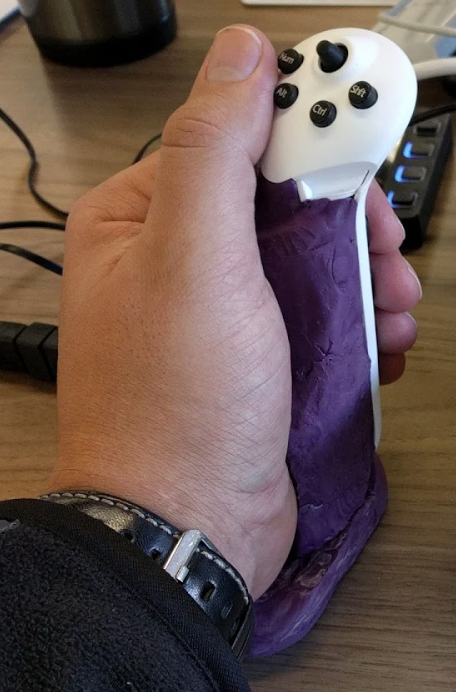 Edit: Just tried putting my thumb inside the strap. It made A a lot easier. I'm going to get me some silly putty. I used "Scotch Removable Mounting Putty", it remains somewhat solid but can be molded easily.